Getting German licens and endorsment. These hotels have rooms with bath and toilet. As a sailor you can get room for about half the price, but then there are no shower and toilet on the room. These seaman's hotels are located close to the Landungsbrücken and all the different departments and authorities are with in walking distance. Well, except Wasser- und Schiffahrtsdirektion (WSD) Nord, they are located in Kiel. Well, you arrive in the evening and you order a wake up call for 0645 the next day. You take a shower and you have your breakfast (5 € for breakfast buffet at Stella Maris Feb 05). You should be here as early as possible so you have time to get all your endorsements and certificates in 1 day. It would be from advantage when you would give a short information about your visit date to avoid unavailing arrival. You can not get a German Master Mariner unless you're a German citizen. You need a course in German laws before you can get your German Chief Officer license. That's a one day course in Hamburg. So you will only get a license as a Watch keeping Officer. Well, by now we have a German Medical examination and a German GMDSS endorsement. You need a Medical examination less than 3 months old to get your license and seaman's book. Then you need you GMDSS endorsement to get your “Nautiche Offizer” license. When you have all the licenses you can get your German seaman's book. You also need a cover letter from the company. Certificates of medical fitness issued by the competent agencies of EU-/EWR-states may be recognized if they have been issued maximally three months earlier than at the time of your application for an endorsement , no matter how long the validity actually is. Authentication of documents should be provided by German embassies, consulates in foreign countries or lawfully appointed notaries. That is the way how we do it in Germany. I will try to issue your endorsement immediately after receiving all necessary documents. In case you're not holder of a German account the payment can be done by cash. But it was pretty convenient to go there by myself, but it didn't come cheap. I had to go to Hamburg to get German certificates, endorsements and a German seaman's book. 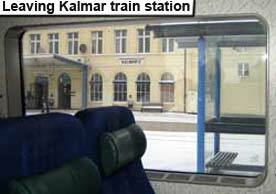 Sunday 27th of February 2005 and I left Kalmar just after 11 o'clock in the morning. I had bought a few news papers at Kalmar train station so I had a little something to read on the train. Hmm, I finished the newspaper before we had left the city limit of Kalmar. Hmm, evening papers cost you 50 cent/ minute to read. It takes you 3 minutes to read the paper if you skip all the crap. 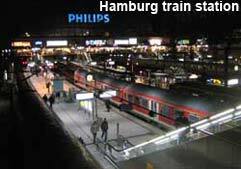 My first leg was Kalmar - Copenhagen and in Copenhagen I had to change to the Hamburg train. 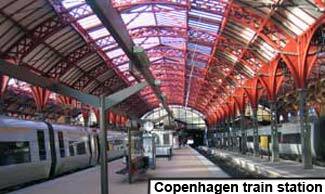 I arrived to Copenhagen at 1500 and the train to Hamburg should leave at 1547. I had time to walk around Copenhagen train station. I bought a few sandwiches and 2 diet cokes, I had planned to eat them on the train. I walked around looking in the shops at the station. I passed the model railway. This model has been at Copenhagen train station as long as I can remember. I liked to watch the model trains when I was a child. The train to Hamburg was full and I could not eat my sandwiches. Hmm, I have to wait until the ferry. I was pretty hungry when we arrived to Rødby and the ferry. 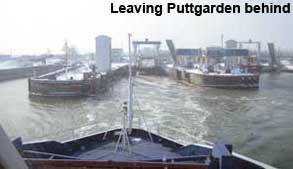 We left Denmark around 1800 and we arrived to Puttgarden, Germany 45 minutes later. 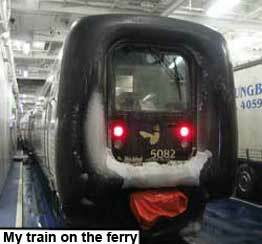 I had my sandwiches on the ferry, but I forgot my coke on the train. Well, I wasn't hungry anymore. We arrived to Hamburg around 2015 and I found myself a taxi. I asked the driver to take me to “Stella Maris” Seaman's hotel. I had booked a room from Sweden. It was 34 € per night. I asked them for the “Sailor discount”. Yeah, we have room for 17 € per night for sailors they told me. - But there are no shower and toilet on the room, they said. - Well, then give me the 34 € room, I said. They had internet on the hotel and I spent some time there before going to my room. At 0630 28th of February my alarm went of. But 30 minutes in a hot shower made me wake up. I left the hotel just after 7 o'clock in the morning. Yeah I know, it was a little early, but I prefer to have the extra time in case I can't find the place. But the guy working on the hotel had printed a very nice map for me when I arrived to the hotel. But you don't have to worry, you will know everything about obtaining your German endorsment after reading about my adventure in Germany. So hang on! This will be exciting! On the map above you can see that I lived close to all the offices and departments I had to visit in Hamburg. 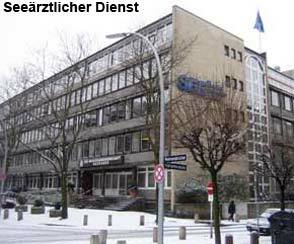 I started with my Medical examination at Seeärztlicher Dienst. About 15-20 minutes walk from the hotel. I arrived in good time and I had to wait for 20 minutes before they opened. At 0745 I registered at the counter. I was sitting and waiting outside the office where I registered. I was sitting on the entrance floor. In the basement they had x-ray, ECG and a room for the nurse to take urine samples and stuff. On the floor above the reception the Doctors had their examination rooms. I don't know what they call it, but there was an open space between the floors. So while I was sitting there waiting the Nurse was screaming from the basement. I had to rush down in the basement for urine sample. Then I was waiting in the basement. I waited and waited and nothing was happening and I decided to buy a Diet Coke in the machine. I almost wetted my pants. I rushed up to 2nd floor to see the Doctor. We did the eye and ear test and blah-blah about losing weight. He wanted me to do an ECG and I went back to the basement. We did an x-ray of my lungs and then I had to wait to do the ECG. First we did an ECG while I was resting and then we did one ECG while I was on a bike. The Doctor and Nurse were cheering on me while I was about to die on the bike. All tests where good and I could leave around 11 o'clock. Now I was in a hurry to Bundesamt f�r Seeschiffahrt und Hydrographie (BSH) so I could get my GMDSS endorsement before going to Kiel. 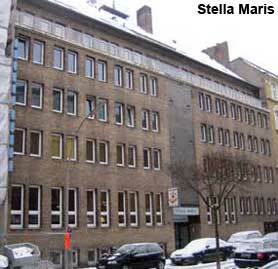 I took a taxi to Bernhard-Nocht-Strasse 78 and I arrived at 1130. I asked for Mr. Marcus in the reception. I had my GMDSS endorsement 20 minutes later, I had a cup of tea while waiting. I asked about my oil and chemical endorsements. - You don't need to have German endorsements. The Swedish certificates are good enough. I saved 75 € and I left for new adventures. I took a walk to the S & U bahn station at Landungsbrücke. I had to ask how to buy the ticket and to change money in a coffee shop. 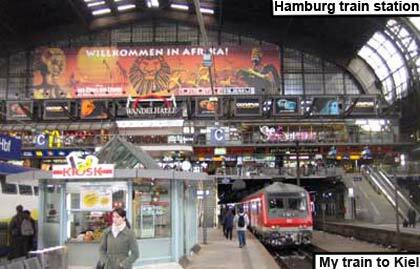 She showed me where to go and I took the U bahn to Hamburg Hauptbahnhof and I arrived there at 1220. There was a train leaving for Kiel at 1220, well, as you understand I missed that train. I had to go and buy a ticket for the train and next train was leaving Hamburg at 1320. When I saw the queue to the ticket office I was in doubt hat I would make it in time, but I got my ticket in time for the 1320 train to Kiel. ETA to Kiel 1435 and they closed at Wasser- und Schiffahrts direktion (WSD) Nord 3 o'clock in the afternoon. I was hoping for no delays while drinking my Diet Coke on the train. 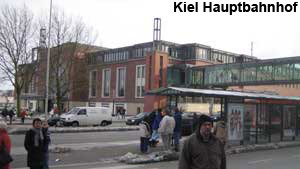 At arrival to Kiel (no delays) I rushed to the taxi stand outside the railway station. I asked one of the drivers if he knew Wasser- und Schiffahrts direktion Nord at Hindenburgufer 247. The driver knew the street and we took off, well, I wished that we took of with smoking and screaming tires. I tried to explain that I needed to be there before 1500. Well, I expected a carpark attendant to show up any time to give us parking fines. We arrived to Wasser- und Schiffahrts direktion Nord about 6 minutes before 3 o'clock. I handed the driver 10 or 20 €. - What OK? Where is my bipping change? I asked. After much trial and tribulation I got my change back. He gave me his card, “Hassan taxi” and he asked me to call him when I wanted to go back. I was sick'n tired of him by then. He had been nagging all the way. - Do you want me to wait for you? How long are you going to stay? Blah - blah! I came in to the reception a few minutes before 3 o'clock and I asked for the miss's in charge for the endorsements. The receptionist called her and 2 minutes later I was sitting in her office. I gave her 52 € and 2 pictures and 10 minutes later I had my German license as “Nautich Offizer”. I asked for a German Master Mariner, but then I need to be a German citizen. If I wanted a Chief Officer license I needed a course in German laws. That's a one day course in Hamburg. My Swedish Master Mariner became a German “Nautich Offizer”. When I came out there was no taxi around. But there was a busstop 2 minutes away, marked on the map. 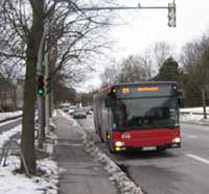 The buses are going every 10 minutes to the railway station, a 4 minutes bus ride. The ride was 1,95 € and we stopped just outside Kiel Hauptbahnhof. I had some time to spend before the train was leaving for Hamburg. I went to the ATM and I bought a Diet Coke for the train ride to Hamburg. I arrived to Hamburg around 1730 and I went to Saturnus, a big electronic shop next to Hauptbahnhof. I bought 2 CDs and I took the S bahn to Landungsbrücke. 5 minutes walk to the hotel and I had a hot shower. I read a little in my book before going to an Italian restaurant next to the hotel. I had a Spaghetti Cabonara and I was off to the Swedish Seaman's church for a cup of tea. The church is located between the hotel and the Landungsbrücke. I was back on my room just after 9 o'clock in the evening. I had an early morning the day after. German Seaman's book and interview at the company in Buxtehude. I woke up at 7 o'clock and I had a long shower before going to the breakfast. I had planned to be at the Seemannsamt Hamburg at 9 o'clock to get my German Seaman's book. I needed a cover letter from the company, and I thought it wouldn't be any use to be there before 9 o'clock. At 9 o'clock there should be people at the company that could fax the cover letter to Seemannsamt Hamburg. It was snowing when I came out and the streets was covered withsnow. 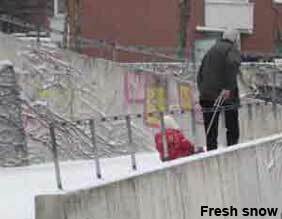 I could see a guy pulling his daughter on a sleigh. I followed them and I got a picture. It was cold but the weather was nice. I had a nice walk to the Seemannsamt. It took me about 15 minutes to go there from the hotel. All the places are marked on theHamburg map above. Everything is close to the hotel and both the S & U bahn goes to the Landungsbrücke. I arrived to the Seemannsamt and I found the right office. I called the company and while they faxed the cover letter I went to the ATM. I needed more cash. It was 21 € for the Seaman's book. When I came back from the ATM it took us about 10 minutes to make the Seaman's book. When I was ready I took a walk to the Hauptbahnhof. I walked around for a few hours and I arrived to the station around 1130. 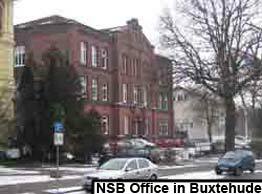 I bought a ticket to Buxtehude, it was not a DB train so I had to buy the ticket at Hamburg trains office. DB is the government and these train was owned buy the city of Hamburg, well, I think so anyway. The train to Buxtehude was leaving Hamburg at 1209 from track 8 and arrived at 1246. My meeting at the office was at 1400 so I had plenty time to find the office. I asked around for directions and it was pretty easy to find. I had time to stop in a model railway shop looking at Märklin stuff. I was still a little early and I found a coffee shop next to NSB's office and I had a cup of tea. I arrived for the interview 15 minutes before 2 o'clock. Everything was ready around 3 o'clock and I returned to the train station. I could see that there was a train leaving for Hamburg-Neugraben at 1535. Well, I had to wait for a little more than 5 minutes. I got on the train and at the next station I had to go off. 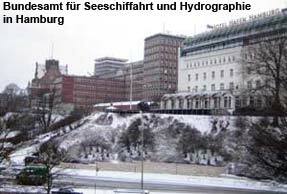 That was Hamburg-Neugraben and I thought that Hamburg-Neugraben was in Hamburg. 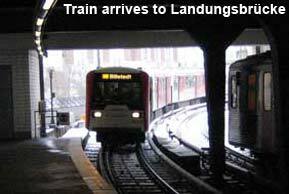 Well, I was lucky, there was an S train coming in and I could go with the S train all the way to Landungsbrücken. No need to change train at Hamburg Hauptbahnhof. I was ready in Germany and I took the 0923 train from Hamburg to Copenhagen 2nd of March. This time there wasn't very much people on the train. I worked a little with my new pictures on the computer and we arrived on the ferry in Puttgarden around 11 o'clock. 45 minutes from Germany to Denmark and I had time for some shopping on the ferry. Wine and candy for Ballong. I also had time for lunch on the ferry. It was nice when we arrived to Copenhagen around 2 o'clock. I had to wait for about 1 hour for the train to Kalmar. Well, departure time 1503, but we were delayed with 15 minutes and we arrived to Kalmar 1 hour late. On the train I meet a AB that I had worked with on Nils Dacke many years ago. The different Maritime Administrations departments you come in contact with while obtaining your German endorsements. 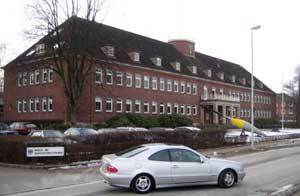 8th of December 2005 I attended a course on German Shipping Law in Hamburg. It was nice to learn a little about all the different departments in the German Maritime Administration. I will TRY to explain it for you. So if you're going to get German certificates you know why you're going where you going. Hang on! Yeah Yeah, enough already. We get the picture!! Hold on!! There is more! Well, just when we thought we had came to and end of it all. They give out the Seaman's discharge book. They also see to that ships have the minimum manning and stuff like that. There are more departments, but this is what we're interested in when obtaining German endorsements. When I came home from Germany it was time to sign on M/T Astoria again.